Where do I begin to list all the desired features of this beautiful home in the GATED community of Oakshire Estates? 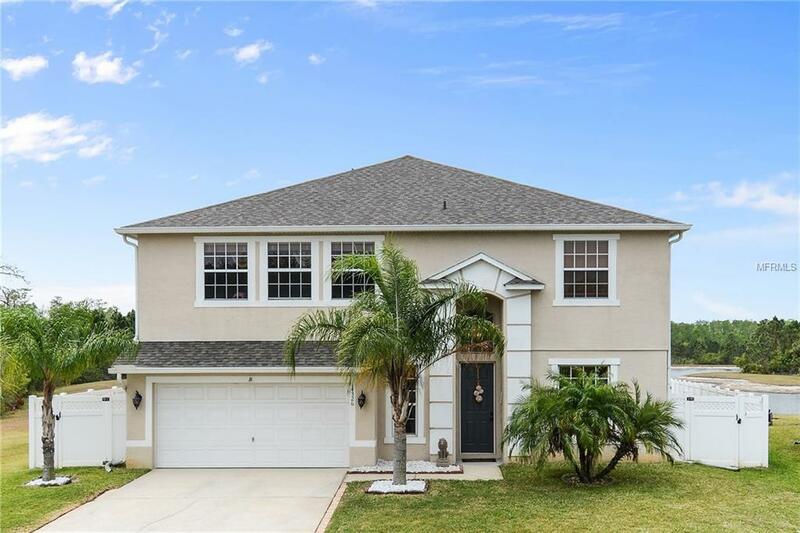 The first floor comprises the combined Formal Living Room and Formal Dining Room, the Newly Remodeled Kitchen with new cabinets and granite counter tops, the half bath, Laundry Room, and the Master Suite, all having ceramic tile flooring except for the Master Bedroom. Exit through the glass sliding doors from the family room out to the very private pool area and large screened in lanai: here there's plenty of room for barbecuing while you enjoy your own patch of paradise watching the sunset over this most serene water view with woods beyond. The second floor boasts 4 large bedrooms, 2 bathrooms and the largest LOFT/BONUS ROOM you can imagine, 17ft by 25ft! Wow! could you put this large open space to good use? In addition to all the great interior features you will financially benefit from a new roof (2017), a New Pool Solar Heater (2017), and two Newer A/C units. This lovely spacious home is conveniently located just a short walk to The Oakshire Elementary School and is about a mile drive to the nearby shopping center, restaurants and Hwy 417. Of course you'll enjoy easy access to the Orlando International Airport, the Theme Parks and all the beautiful beaches that Florida has to offer. This home is currently owner occupied and they wish to remain in the home until September. Please call me or your Realtor for details regarding this special circumstance. Listing provided courtesy of Re/Max Marketplace.